A public health problem due to its frequency in tropical regions with hot and humid climates, tropical phagedenic ulcer has considerable social and economic repercussions in the first half of the 20th Century. The Colonial Health Service comes across it in almost the whole of the French colonial domain. Beginning as a common place ailment capable of becoming serious, it is a circular ulceration of the leg or foot which can extend about ten centimetres. In 1884, in Guyana, Le Dantec* describes its clinical aspects, defines its pathogenesis and reveals its microbic aetiology that H. Vincent completes in 1886. Its complications evolve from chronicity to canceration. 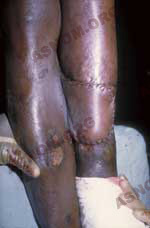 Its treatment, simple but laborious, raises a problem of cicatrisation which often requires surgery, involving operations, from skin grafts (to cover the affected area) to the amputation of cancerous ulcers. When a relatively easy method of prevention is put in place, phagedenic ulcer ceases to be a public health problem. At the end of the 19th Century and in the first half of the 20th, phagedenic ulcer (from the Greek "voracious appetite") is very frequent in the tropics. Chapuis reports that in 1861 "Guyana Ulcer" causes ravage among convicts. Of 8 373 cases hospitalized, 1 812 have phagedenic ulcer, which amounts to one-fifth of those hospitalized. The name "tropical phagedenic ulcer" is given to it in 1862 by Leroy de Méricourt and Rochard who thus unite the various appellations of the disease. 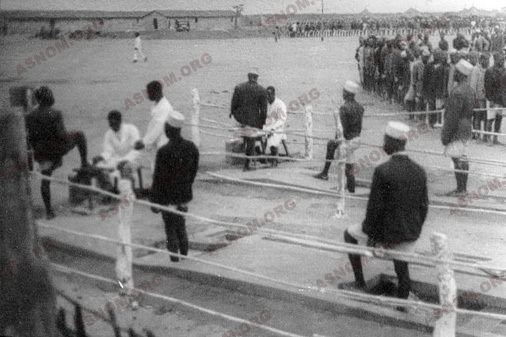 Le Dantu*, in 1933, reports that 11 903 cases have been treated in Sudan and 15 748 in Cameroon. The social and economic repercussions are considerable. At the beginning of the 20th Century, Bouffard* writes : "Phagedenic ulcer is the most widespread ailment in the tropics. The extent of its geographical domain and its frequency puts it at the head of the diseases that every practitioner will be confronted with as soon as he arrives in countries with hot climates. He will find the disease makes work in hospitals and dispensaries difficult, depriving administrative and private work sites of one-third of their staff". It rages powerfully among native soldiers when military expeditions are undertaken and among native workers when roads and railways are being constructed. In 1935, Pons* reports that in Indochina, phagedenic ulcer is rampant to such an extent in all the farming and forestry development concerns "that a service specially adapted to the prophylaxis and treatment of this disease had to be created". In 1884, in Guyana, Le Dantec*, while observing an epidemic of phagedenic ulcer among convicts, discovers at the bottom of the ulcer, a large quantity of bacilli. In 1886, in Alger, the military physician H. Vincent observes this tropical phagedenic ailment in Arab conveyors returning from the campaign in Madagascar and he assimilates it to infection acquired in hospitals ("pourriture d'hôpital") which was widespread at the time. He finds both the bacillus and a spirillum, whence the appellation proposed by Le Dantec*: "Association fuso-spirillaire de Le Dantec-Vincent". Common pyogenic microbes then cause superinfections in the open lesions. - The disease occurs in humid forest and marshy regions in the equatorial zone of Africa or America, Indochina, the Indies and Oceania. - It affects above all (95 %) the feet and legs of adolescents and rural workers who are in contact with water or mud (in paddy-fields). Rare in populations protected from micro-traumatism by clothes and shoes, it is very prevalent in rural populations whose hygiene is rudimentary, who walk about bare-footed and are in constant contact with aggressive natural elements. From the starting point of an ulcer, the fuso-spirillar transmission to a cutaneous lesion is possible by flies, through contaminated bandages or by voluntary auto-inoculation, as in the case of convicts who wish to be exempted from painful tasks (Moustardier*). A poor state of health predisposes one to phagedenic ulcer. At the beginning, it is a little circular ulceration, purplish red in colour, very painful, covered by a fake membrane. Progressively, the pain diminishes while the ulceration widens and deepens, attaining a diameter of 5 or 10 cm ; its thick edges, raised up and detached, are distinct and the bottom of this crater is filled with necrosed tissues which give out a fetid smell. After five or six weeks of evolution, the extension stops, the pain is reduced, the edges disappear but cicatrisation does not take place; within the cavity there is swelling and suppuration. If the ulcer heals, the discoloured skin remains fragile and susceptible to recurrence of the affection. This chronic ailment evolves during months or years, and complications may follow : retraction of tendons, in particular the Achilles tendon resulting in a "phagedenic club foot" (Cl. Olivier*) or extensors of the foot, infections in adjacent parts of the body, manifestations of cellulites, phlegmons, lymphangitis, arthritis, osteitis (of which Dejou* studies the radiological effects in 1941), with the possibility of pathologic fractures. Finally, after 5 to 20 years of evolution, a cancerous state may set in, already evoked by Assali* in 1934 ; it is a spino-cellular epithelioma well-studied by Camain*, which invades the inguinal and iliac lymph glands. Its frequency ranks it in the second place among the cancers that afflict Africa in the 1960s. These particular characteristics make it possible to identify it easily in contrast to other frequent ulcerations to be found in the tropics (syphilis, tuberculosis, leprosy, yaws, mycosis, varices, etc...). On the other hand, it can be mistaken for cancer with mycobacteria or Buruli ulcer observed by Perquis* in Brazzaville in 1966, cases of which multiply since the 1980s in confined African breeding places (Josse*). The treatment of phagedenic ulcer is often accomplished on many patients by medical assistants in dispensaries that are not adequately provided with medicines, it is a "treatment for the masses". It is essentially directed towards the healing of the patients, even if it is important to re-establish good general health conditions. - A general anti-infectious treatment, formerly with arsenical substances and then, when they are discovered, with sulphonamides, antibiotics, metronidazole, separately or together, is only efficacious at the very beginning of the evolution of the ulcer. It is, above all, useful in the case of regional or general infectious complications or as an accompaniment to certain surgical gestures. The attempts to perform intra-femoral injections of mercurochrome, then sulphonamides and finally penicillin, in spite of a favourable effect on ulcers in the acute stage, have now lost their interest. - The local treatment put into operation must, first of all, stop the gangrenous process by deterging the infected wound and eliminating the nauseous membrane; then it must bring about cicatrisation. - Diverse cleaning procedures; mechanical or chemical, followed one another : red-hot iron and, later, the curette for Le Dantec* and Clarac*; rubbing with a cleaning pad impregnated with sublimate or carbolic acid or, possibly, curettage for Vincent ; exposure to the sun's rays for Fontoynont and Jourdran* ; mechanical cleaning with pliers and scissors under a jet of warm boiled water for Assali*. - Bathing in an antiseptic liquid with permanganate or bleach, which facilitates the detachment of the bottom of the ulcer, possibly using pliers. Blondin* and Riou* advocate striking the ulcer "drop by drop" : from a large glass placed at a height of 75 cm boiled water containing an antiseptic falls at the rate of a drop every second during two or three hours. Dakin recommends bleach or permanganate solution. This not very painful and non-aggressive procedure is perfectly adapted for practice in dispensaries where one still finds benches fitted out with receptacles for liquids. Generally, the phagedena is halted in three or four days. Surgical excision, which is possible with recourse to antibiotherapy, is the method that is now resorted to. - To realise cicatrisation after cleaning the ulcer, most of the antiseptic and healing substances available at the time are used. The advent of sulphonamides and local antibiotics are a real breakthrough. Antibiotic-impregnated dressing gauze causes granulation. 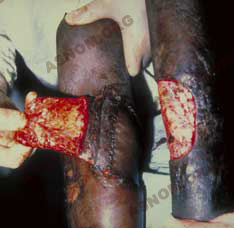 When the granulation tissue is sufficient, palpation with silver nitrate or dressing gauze impregnated with local corticosteroids lead to epidermalization. In the case of large ulcers, dermoepidermal transplants must be resorted to or sometimes transplants of the entire skin pedicle (Nosny*, Marcotorchino*, Mear* and Courson*). Surgical excision followed by a transplant has become the ideal treatment for every chronic ulcer or every recent ulcer that resists treatment. Complications arise from non-typical surgical techniques adapted to the situation. - Making wounds and cutaneous excoriations on the lower limbs rare by clearing brushwood in villages and around them and also with protective clothing (trousers and shoes). 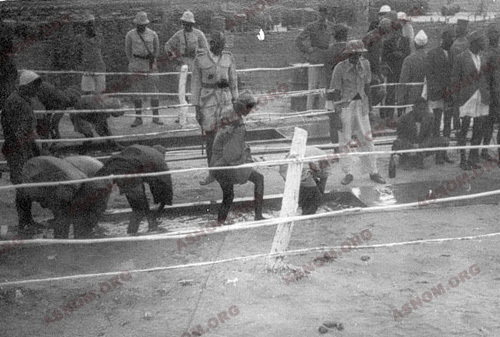 In 1903, Chauvel observes in Algiers that 643 Kabyle conveyors, having phagedenic ulcers when they return from the Madagascar Campaign, had not worn shoes, whereas French soldiers and native skirmishers who were obliged to wear shoes were unaffected. - The daily systematic inspection of legs in work places, made easier by passing through footbaths at the end of the day, with systematic antiseptic swabbing of the excoriations and the bandaging of the wounds thus revealed. - The combat against the elements that favour the spread of the disease - under-nutrition, anaemia, avitaminosis. - The prevention of contagion in dispensaries by changing bandaging materials and assuring protection against flies. Whenever these measures are applied, phagedenic ulcer ceases to be a public health problem. - Assali J. : L'ulcère phagédénique pp. 206-218 dans "Clinique Chirurgicale des Pays Chauds" de BOTREAU-ROUSSEL - 1 vol. Masson et Cie 2d. Paris 1938. - Bourrel P. et Ferro R.M. : Ulcère phagédénique, pp 602-607 dans "Santé et Médecine en Afrique Tropicale" de Pene P. et Coll. Tome 2, Doin éd. Paris 1980. - Bourrel P., Huet R., Piquard B. : Aspects de la chirurgie plastique cutanée sous les tropiques- Ann. Chir.Plast., 1975, 20, n° 3-4,pp. 275-283.